Fannie Mae and Freddie Mac haven&apos;t been major factors in the near destruction of our entire financial system for like seven years. Isn&apos;t it high time they get to vacate the penalty corner, and maybe have a cookie? 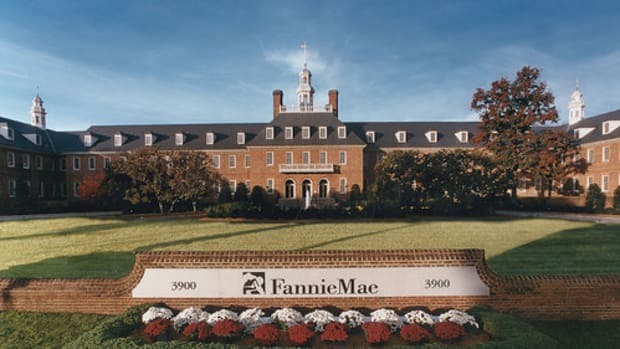 The regulator of Fannie Mae and Freddie Mac is considering raising the pay for the companies’ chief executives over the objections of the U.S. Treasury Department, others within the Obama administration and some lawmakers. The raises would be a significant change for the companies, whose chief executives last year earned $600,000 in salary without bonuses. The move to bump up pay at the country&apos;s two most notorious - and government-backed - mortgage firms is being teased out by Federal Housing Finance Agency director Mel Watt who is basically arguing that he can barely hire an intern for just over half a mil. “The current Chief Executive Officer compensation framework limits the ability of the Boards of Directors at Fannie Mae and Freddie Mac to promote retention of their CEOs, to develop reliable CEO succession plans, and to ensure continuity of operations and organizational stability,” Mr. Watt said in a statement. Sure, Freddie and Fannie have an approval rating somewhere between Mel Gibson and Floyd Mayweather, but that&apos;s the good news. Watt himself is an Obama appointee that just pissed off the very people who got him the gig and held his hand through a brutal confirmation process. Now they&apos;re displeased with Mel and not staying quiet about it. White House spokesman Josh Earnest said that given the taxpayer backstop on the companies, “I think it is entirely legitimate for the executives at those institutions to be subject to compensation limits.” Mr. Earnest also said that the compensation limits also shouldn’t deter attracting talent to Fannie and Freddie. “They still enjoy significant financial compensation even if its’ not in line with their counterparts in the private sector,” Mr. Earnest said. Looming over this like a phantom menace is the upcoming election cycle, with Elizabeth Warren still looking to pin her "steady" and Tea Party activists doing their best to keep enough room for the Holy Ghost between their candidate and greedy financial types. None of that seems to be dousing the thirst of Fannie and Freddie board members however, who seem hell-bent on getting back to the $4 million annual compensation mark company CEOs enjoyed before the great purge of 2011. But are they maybe ignoring something? Last week, stress test results released by the Federal Housing Finance Agency indicated Freddie Mac, along with Fannie Mae, would require up to $157.3 billion in additional support from the U.S. Treasury in a severe economic downturn. It'll be a dark day in hell before either company starts paying dividends. Apologies to the people to whom this news comes as a surprise.